There were two Flakpanzer IV types, namely the Flakpanzer IV (2cm Flakvierling 38) auf Fgst PzKpfw IV Möbelwagen (furniture van) and the Flakpanzer IV (2cm) mit PzFgst Panzer IV/3 Wirbelwind (whirlwind). 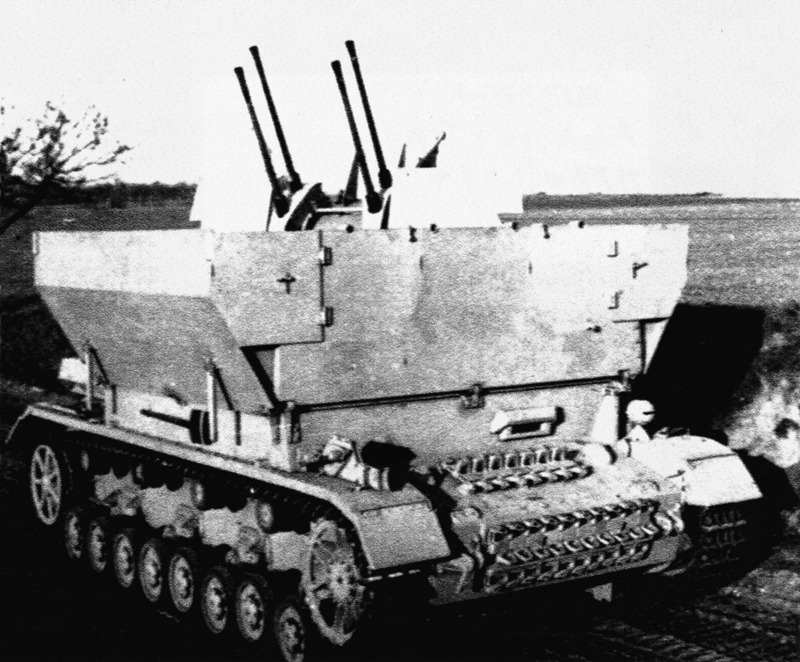 The former was developed as the Flakpanzer 38(t), with one 20mm FlaK 38 cannon on a Czechoslovak light tank chassis, and had not proved satisfactory, and the new type entered production in 1943. The Möbelwagen comprised a Flakvierling 38 four-gun mounting (provided with 3000 rounds) on a PzKpfw IV medium tank chassis. A large rectangular fighting compartment of armour plate was provided above the superstructure for protection, and in action this compartment’s walls were lowered to the horizontal position to enlarge the fighting platform. The gun mounting could be traversed through 360° and elevated in an arc from +10° to +90°. The Flakpanzer IV (2cm) mit PzFgst Panzer IV/3 was introduced at the end of 1943 after being designed to provide better protection to the gun crew through the installation of the Flakvierling 38 (with 3200 rounds) in an open-topped octagonal rotating armoured turret that could be rotated through 360° and provided the gun mounting with an elevation arc between +10° and +90°. The specification applies to the Wirbelwind.